Custom Personalized Golf Umbrellas in Bulk. Inexpensive, Promotional. Budget Prices for USA, Canada. 60 in. arc. 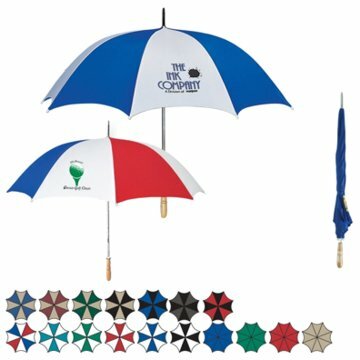 Bulk custom imprinted Golf Umbrellas in many colors. This windproof personalized golf umbrella will not break in strong winds. It displays two colors on alternating panels or or just one solid color. Our bulk imprinted golf umbrellas have a metal shaft and a finger grip handle. They measure 41" from tip to end of handle, and 60" across the top (the arc). Free artwork design. Budget Prices in the USA and Canada for wholesale pesonalized golf umbrellas. American clients pay no taxes.